Last week we spent time with family in the mountains of NC. My sister and her husband live in the smokies and we had to drive our van literally through a creek to get to their house. We spent the first part of the week doing the mountain thing, I got a totally useless fishing license, because the trout were not biting. Andrew and I slept in a tent listening to coyotes howl off in the woods. We shot guns, took hikes, picked blackberries (ad a few ticks) and saw some beautiful terrain. On Friday we headed to TN the scenic way, through several national forests, and arrived in Cleavland TN for my cousin Christy's wedding. She was a beautiful bride, and I am proud of her and her new husband. 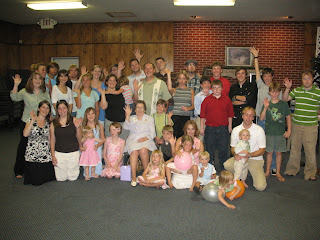 On Saturday we had an 80th birthday party for my grandmother with over 75 of her offspring in attendance. It was neat to catch up with family and see all the influence that a godly homemaker can wield. Here is a picture of her with her grand and great grand kids. We went to church in Atlanta at Northpoint Community Church where Andy Stanley is the pastor. The service was awesome, but the parking was terrible. It literally took 30 minutes to get out of the parking lot and back on the road. It is amazing how such a great church can be hamstrung by parking problems. I expected to learn a lot of different lessons from my visit to Northpoint, but I guess parking was what God wanted me to take away. We as a church must not let little foxes spoil the vine. Every detail matters & leaving impressions are lasting impressions. I would be remiss if I did not thank Pastor Gabe, Sue, and all the volunteers for pulling off a great Sunday in my absence. In many ways I wished we were here.